People walk on the flooded street of Buzi, central Mozambique, on March 20, 2019 after the passage of the cyclone Idai. 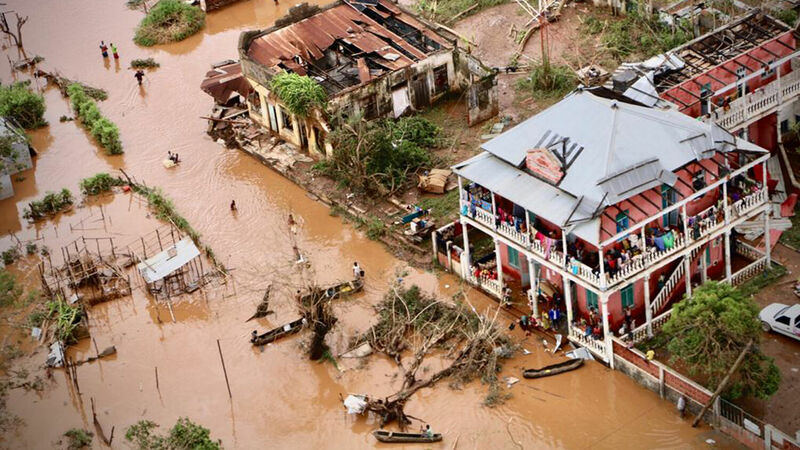 Cyclone Idai made landfall on March 15, killing hundreds of people in Mozambique, Malawi and Zimbabwe. Thousands more have been stranded. More than a million have been affected by subsequent flooding. Idai hit the coastal city of Beira, Mozambique, with wind speeds over 100 mph and a destructive 6½-foot storm surge. The storm caused landslides that wiped out homes and other buildings. A week later, as the storm pushed inland and brought with it devastating floods, about 15,000 victims remain isolated, stranded on rooftops and trees, with little or no food or drinking water. Around the Buzi River and Pungwe River, which broke their embankments, flood waters rose high enough to completely submerge entire homes. The confirmed death toll across the affected countries, as of March 21, is 350 lives. With many more missing and stranded in squalid conditions, the number will no doubt rise dramatically. Mozambican President Filipe Nyusi has estimated there will be more than 1,000 deaths. Of those who have so far escaped the disaster with their lives, as many as 400,000 people have lost their homes, according to the Red Cross. The United Nations estimated that at least 1.5 million additional people will be affected by the storm’s aftermath. Aid workers are striving to evacuate as many victims as possible, but resources are stretched thin. “Sometimes we can only save two out of five,” said Ian Scher, ceo of the nonprofit aid organization Rescue South Africa. “Sometimes we rather drop food and go to someone else who’s in bigger danger. We just save what we can save, and the others will perish.” Some affected areas, especially in Zimbabwe, are simply impossible to reach. Nations are pouring in relief funds. The United States has pledged $15 million, and the United Kingdom has pledged $23.8 million. The European Union has provided $4 million in aid, and Tanzania has flown more than 262 tons of medical supplies and food to the affected areas. The situation in Mozambique, Malawi and Zimbabwe is a massive humanitarian crisis, but more than that, it is a sign of things to come! “And as [Jesus] sat upon the mount of Olives, the disciples came unto him privately, saying, Tell us, when shall these things be? and what shall be the sign of thy coming, and of the end of the world? And Jesus answered and said unto them, … For nation shall rise against nation, and kingdom against kingdom: and there shall be famines, and pestilences, and earthquakes, in divers places” (Matthew 24:3-4, 7). One of the signs Christ gave them of His Second Coming was increased “natural” disasters! Christ then gave another important sign of the end time: weather patterns and other natural phenomena taking a violent turn for the worse! “And ye shall hear of wars and rumours of wars … For nation shall rise against nation, and kingdom against kingdom: and there shall be famines, and pestilences, and earthquakes, in divers [different] places” (verses 6-7). Notice, in addition to the “wars and rumours of wars”—surely an apt description of the current state of international relations—Jesus told His disciples that His return would be preceded by an uptick in natural disasters. We are seeing this prophecy play out before our eyes! The horrific disaster that hundreds of thousands—even over 1 million—are suffering through in southeast Africa is just one crisis in a long list of recent natural disasters plaguing the world. 2018 was a historic year for destructive wildfires in California. In December, well over 1,000 people died in Indonesia after the nation was wrecked by earthquakes, tsunamis and a volcanic eruption. The list of destruction could go on and on. These disasters and the flooding in Africa are far from “normal.” God Himself “withholdeth the waters, and they dry up: also he sendeth them out, and they overturn the earth” (Job 12:15). God sends these “natural” disasters in an attempt to wake up this world from its sins! These are not normal times. The Bible says earthquakes, droughts, floods, tornadoes, hurricanes and tsunamis are anything but normal. They are curses man has brought upon himself as a result of disobedience to God’s laws. And the Bible says that … they are about to get so bad that they can legitimately be compared to the events described in the pages of the Holy Bible! As terrifying as these “natural” disasters are, they are only the “beginning of sorrows” (Matthew 24:8). It is up to each one of us individually to heed this warning from God and wake up before the Great Tribulation strikes the Earth! By that time, there will be suffering through the Earth “such as was not since the beginning of the world to this time, no, nor ever shall be” (verse 21). Despite what is coming in the immediate future, there is incredible hope beyond it! All these fulfilled prophecies point toward the return of Jesus Christ, when He will usher in a new age, free of suffering. Request a free copy of Herbert W. Armstrong’s booklet The Wonderful World Tomorrow—What It Will Be Like for a picture of what is coming to this world! For a deeper understanding of the real cause and solution to this world’s “natural” disasters, read our free booklet Why ‘Natural’ Disasters?